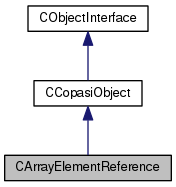 This class is used to make an element of an array accessible as a CCopasiObject. Usually an object from this class will be a child of a CArrayAnnotation and will reference a single element of the array that the CArrayAnnotation points to. Definition at line 29 of file CArrayElementReference.h. create an element reference with a given index. The index is passed as a string, e.g. "" The object name will be the index string, the type is "ElementReference" pParent may not be NULL. Definition at line 18 of file CArrayElementReference.cpp. Definition at line 66 of file CArrayElementReference.h. Definition at line 89 of file CArrayElementReference.cpp. References CCopasiObject::getCN(), CCopasiObject::getObjectParent(), and mIndex. Definition at line 69 of file CArrayElementReference.cpp. References CCopasiObject::getObjectAncestor(), CCopasiObject::getObjectDisplayName(), CCopasiObject::getObjectName(), CCopasiObject::getObjectParent(), CCopasiObject::getObjectType(), and mIndex. Definition at line 74 of file CArrayElementReference.h. returns a pointer to the numerical values of the array element this will be a *C_FLOAT64 for this class. Definition at line 35 of file CArrayElementReference.cpp. References CArrayAnnotation::array(), C_INT32, CArrayAnnotation::dimensionality(), CCopasiObjectName::getElementIndex(), CCopasiObjectName::getElementName(), CCopasiObject::getObjectParent(), mIndex, and CArrayAnnotation::size(). Definition at line 97 of file CArrayElementReference.cpp. this method does nothing at the moment! Definition at line 29 of file CArrayElementReference.cpp. this contains the index in string format, e.g. "" Definition at line 38 of file CArrayElementReference.h. Referenced by getCN(), getObjectDisplayName(), and getValuePointer().